Clean WORLD Movement: Planting Trees at Gainesville, FL, U.S. The members of the Intl. 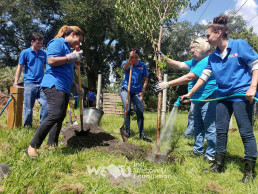 WeLoveU Foundation planted trees in Gainesville, FL, U.S., on August 19. More than thirty members chose volunteer service over a relaxing holiday, and planted seedlings along Prairie Creek Lodge to cope with climate change and environmental contamination. It wasn’t easy to dig deep and cover them with soil and manure, as the seedlings were quite big, yet the members did their best, hoping they would grow tall and help keep the earth clean and healthy. Young adults who joined the work with friends felt rewarded that they contributed to the environmental protection. Their smiles were brighter than the shining sun after planting trees and watering to pack the dirt firmly.